Get recognized as an expert in your profession! Why choose Disaster Recovery Institute certification? Disaster Recovery Institute certifications are globally accepted and recognized. They combine the achievement of passing an exam with credit for your work and educational experience, giving you the credibility you need to move ahead in your career. DRI International certifies individuals and provides various levels of active professional certification in a number of areas. Our certifications are the standards of excellence in business continuity management whether you are a practitioner, vendor, or auditor. A DRI certification is the most widely recognized and respected certification in the world for professionals that have demonstrated both knowledge and experience in a variety of roles, including: Business Continuity, Disaster Recovery, Emergency Management, Risk Management, Crisis Management, and Operational Resilience. Why should I be certified with DRIC? What’s in it for me? 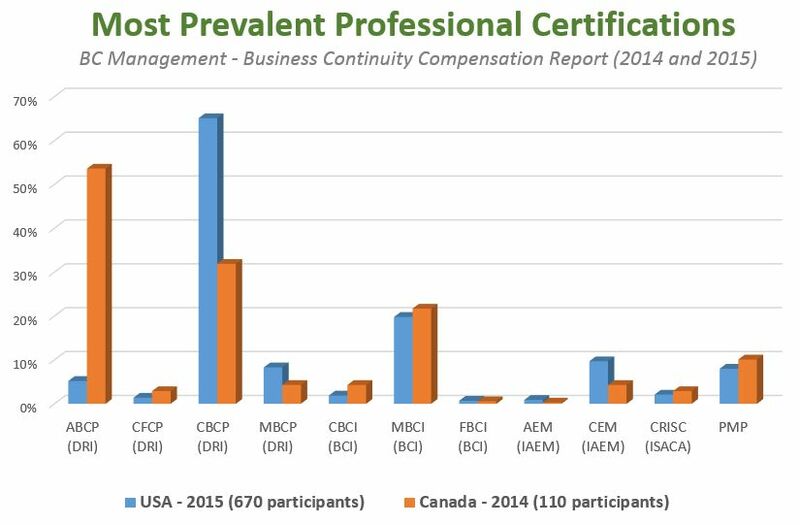 The top certification for Canada for 2014 was the Associate Business Continuity Professional (ABCP) from DRIC, which made up 54 percent of the study participants. 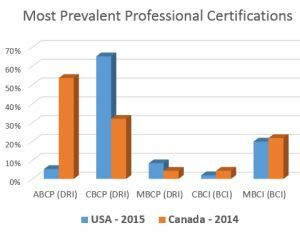 The top certification for the USA in 2015 is the Certified Business Continuity Professional (CBCP) from DRII, which made up 67 percent of the study participants. Why should my organization be interested in DRIC education and certification? Certification proves to employers that you have what it takes to add value to their enterprise. In fact, many organizations and governmental agencies around the world require or recognize DRI’s certifications. When an organization wishes to build or improve its BC program, it must ensure that its business continuity efforts are well designed and effectively managed. An organization with certified DRIC professionals among its staff can be confident that the business continuity program is properly focused and will provide the organization with what it needs. When a BC program has been built with the guidance of certified DRIC professionals, an organization can be confident in its ability to successfully manage a significant disruption incident. When choosing the professional who will be able to introduce and structure a new BCM program, organizations can trust that DRI certified individuals have a level of knowledge and experience equal to the task. The business can be certain that they are hiring a true professional whose qualifications have undergone scrutiny. An organization that has spent years and precious resources building a strong business continuity program should only consider hiring professionals to maintain and improve their plan. DRI certified individuals have taken the time and energy to prove their expertise. are only a few examples!